So I got a sample of Syoss Treatment Mask with one of latest orders from Japan and as I've always been fairly impressed with the few hair care products I've used and tried in Japan, I thought it would be a treat. Now the tricky part. Okay, so I like it, and we don't have Japanese supermarkets around here (ok, we do in London, but they don't carry cosmetics and hair products like in the US, yeah I'm looking at you, California with my green eyes!) So the question remains, is it amazing enough to warrant paying to have it shipped from Japan? That almost always equals a big expense, so it has to be worth it. I did a bit of hunting on the net. I'm detective, just like Kindaichi or MatsuJun in his latest drama, Lucky Seven, which I highly recommend by the way! 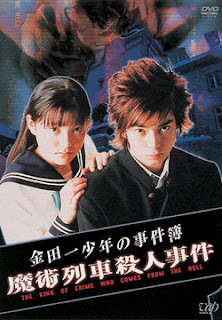 Coincidentally, MatsuJun played young Kindaichi in the 3rd season of Kindaichi Shounen no Jikenbo. Yeah, but anyways, Syoss seems to be a brand name in Germany, the Netherlands, and Scandinavia here in Europe. Score! Maybe I won't have to order from Japan, if I can get something from my friendly German/Dutch/Scandinavian neighbours instead, that would be wonderful! While trying to find a way to get Syoss into the UK, I found quite a few sites claiming that Syoss and TRESemmé are the same brand! TRESemmé!?! Really? Okay, that is easily available in the UK (and the US from what I recall). And yeah, okay I haven't tried it in years. Shall I get treatment mask from TRESemmé in the UK and see if it matches up? I think I will. Will let you know the results! Altho, I love MatsuJun, I have to say I remember the first two seasons of Kindaichi with Domoto Tsuyoshi back in the mid 90s with fondness. I was still a kid, but I remember these series being so good and scary! Ah, I think I have this on VCD even! Remember VCD? Now I feel like digging them out and rewatching. Were/Are you a Kindaichi fan (any of the TV shows, anime or manga... even original novels)? I've not heard of this brand before. Funny how despite globalization, some brands don't go into certain markets. I suppose it has a lot to do with cost vs profit. By "soft" what do you mean? I find with my hair, "soft" means its limp and flat.